In the era of the postmodern, post-truth, post-‘whatever else we purport to have progressed beyond’, a book which aims to re-write American history as we know it might seem the height of cliché. And, in its simplest form, that is exactly what John Keene’s Counternarratives sets out to do. Thirteen sections, ranging from novella to brief rumination, divided into a tripartite structure, together endeavour to re-align the Caucasian settler-centred narrative of the Americas and give minorities – particularly Afro-Americans – suitable acknowledgement for their influence on the contemporary nation. Any hint in this summary of a predictable, anaemic revisionist effort, however, in no way does credit to the magnitude of Keene’s latest triumph, which relentlessly bombards the reader with highbrow musings and skilful literary finesse. This work is an insatiable pursuit of racial recognition and redemption which ultimately develops into a galactic investigation into human nature itself, all the while sustaining the control and measure indicative of an accomplished writer, and a perspicacious mind. Keene begins his history in a manner coherent with this objective. The short story ‘Mannahatta’ recounts the landing of New York’s legendary first non-native settler, Juan Rodriguez, in 1613, thereby challenging the widely accepted date of the city’s foundation in 1624. The style is poetic and lyrical, reminiscent of the epic Virgilian verses woven in eulogy of the civilisations of antiquity. As Aeneas’ fate was bequeathed by Jupiter, so too does Keene portray Rodriguez as ordained to settle in the Americas when ‘despite having no timepiece, he knew it was time to return’. The words of Afro-American writer James Baldwin precede the first section of Counternarratives – “perhaps then, after all, we have no idea of what history is” – and Keene artfully expounds this vision for his book through Rodriguez’s myth, as he immediately destabilises any confidence in the status quo. This technique of destabilisation segues into the following story of the Figueiras family, which has been integral to the formation of Brazil across many generations. On top of the unexpected move south, the chapter opens with a newspaper article about the death of one of the family’s 21st century members, once again challenging the usual lucid, chronological narrative of history. As the Figueiras family history takes shape, it soon becomes clear that Keene believes strongly in the power of familial connections and the influence which they can have on the future. There is something of Roland Barthes’ ‘infinite text’ here – a shared network of concepts and blueprints transcending time – although, if that is the case, the chapter’s opening death and concluding sombre consideration of favelas leaves the reader less than optimistic about the virtue of human hardwiring. William Faulkner once quipped that “the past is never dead. It’s not even past”, and it appears that Keene swears by this mantra, even if his version of the past differs significantly from that normally told. Having developed his philosophical interpretation of history, the author then shifts focus on to the forgotten voice in American history. Stories of religious upheaval in a 17th century Portuguese colonial monastery, an 18th century black slave’s futile quest for liberty, and supernatural occurrences regarding a Haitian slave at a Kentucky convent in the 19th century develop this subject matter. At times the relation, or indeed intention, of these stories is unclear and befuddling, especially with Keene’s superimposition of unsettling postmodern literary techniques on to the pre-modern period. The reasons for doing so could be many, and are certainly open to interpretation, but as is often the case with Counternarratives, the overall impression feels more significant than the exact meaning behind all the minutiae. What is clear, however, is that in all of these stories there is an underlying tension between deference and authority: slave and owner; warring nations; religion; race. ‘The Strange History of Our Lady of the Sorrows’ is interrupted by subsections titled ‘The Role of Duty’ on a number of occasions, reinforcing this conflict. Carmel, its protagonist, draws scenes advocating racial uprising even as she tries to perfect her loyalty to God. In the first section of his book, Keene’s most resonating comment is that nothing brings about change and historical development more dramatically than the collision between antitheses. Part two – ‘Encounternarratives’ – refocuses once more, particularly on how the passing years have caused the tectonic plates of racial division to shift slowly in America. A black boy plays an instrumental role in the Unionists’ war effort, and later fiction meets non-fiction creatively as Keene imagines a future meeting between Jim and Huckleberry Finn in the American Civil War, which deals a devastating blow to Mark Twain’s romanticised notion of comradery between white master and black slave. The main tension in ‘Encounternarratives’ is exactly that – between white and black Americans – as Keene challenges the extent to which deep-rooted inequality has truly been eradicated. In ‘The Aeronauts’ for example, Red’s ability to bridge the racial gap is symbolised by his step into the white scientists’ balloon, but the ultimate sacrifice he must pay for this is surely too severe. To view the middle of Counternarratives solely through a racial lens would, however, be myopic. Music, literature, nationality, sexuality, family, individualism and faith all play formative roles in Keene’s anthropological inspection of human relations throughout history, leaving the reader with a powerful impression of a writer interested in far more than mollifying some postcolonial vendetta. Once again, the charge could be brought that his task is simply too enormously ambitious, and consequently the book drifts beyond the grasp of intellectual mortality in its complex and esoteric alleyways. But to attempt any less would commit the even more heinous sin of oversimplifying and reducing human nature, the very thing which so irks Keene in the conventional understanding of our past. As the past trails into the present until it is no longer behind us, so too must Counternarratives’ history come to its own final resolution. In answer to this call, Keene’s final section – ‘Counternarrative’ – provides a dialogue between two revolutionaries in a postcolonial dystopia (or “universal present” in the apt words of Times Literary Supplement reviewer Kate Webb). The leader, a malign unstoppable force, so much so that he is now “beyond fear”, is pressing charges against, and ultimately about to condemn to death, his former revolutionary comrade, ‘the prophet’, for treasonous actions. Despite this looming blade of fate, the book’s concluding note is offered by the prophet, who warns the leader that, whilst he might feel immune now, one day another shall come and bring about his own demise. Whilst any context or details are omitted, achieving a universalising effect, the emotions and ideas conveyed show clearly that Keene believes this to be a plausible ‘end’ to human progression, if we continue to consent to our vices. More specific to this book’s central tenet, even if minorities were to gain equality and proceed to subjugate their former oppressors and reach their own zenith, if we are unable to tackle the causes of past and present suffering and conflict, history will inevitably repeat itself. And that is just as assured in Keene’s ‘counter history’ as it is in any version which he seeks to undermine. Counternarratives is not merely a bid to dismantle ‘white American’ ascendancy, although it does so compellingly. It is also a convergence of many journeys: the settlers’ quest to discover a new world; the Afro-American desire for racial equality; America’s journey to where it is today; how human ideas have changed with enlightenment, and how they have not. The extent to which this comes together in 400 pages will be at the discretion of subjective verdict, but admiration for its literary flair and intellectual scope is not. Ultimately, Keene wants more than anything to impress upon us the simple fact that the status quo should never be accepted lazily. As George Santayana – Spanish philosopher and character in Keene’s ‘Persons and Places’ story – claimed, “Those who cannot remember the past are condemned to repeat it”. John Keene offers us all a legitimate reason, and perfect opportunity, to judge whether the past we are remembering is the right one. John R. Keene was born in St. Louis in 1965. He graduated from the St. Louis Priory School, Harvard College, and New York University, where he was a New York Times Fellow. In 1989, Mr. Keene joined the Dark Room Writers Collective, and is a Graduate Fellow of the Cave Canem Writers Workshops. He is the author of Annotations, and Counternarratives, both published by New Directions, as well as several other works, including the poetry collection Seismosis, with artist Christopher Stackhouse, and a translation of Brazilian author Hilda Hilst’s novel Letters from a Seducer. He teaches at Rutgers University-Newark. Counternarratives is published by Fitzcarraldo Editions. Author bio courtesy of the same. 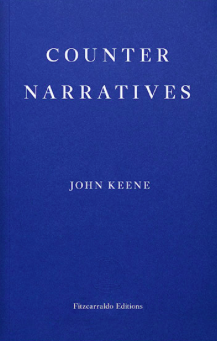 Posted in Book reviews and tagged America, Counternarratives, John Keene. Bookmark the permalink.